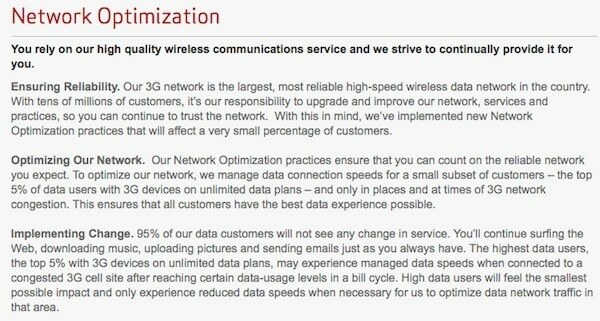 Verizon Now Throttles Customers On 3G Unlimited Data Plan, Preparing for iPhone 5? At the beginning of the year, back in February, Verizon updated its policy stating that they might start throttling (reducing data speed) for the most data hungry users. Yesterday, this policy took effect affecting 5% of the Verizon customers, so this won’t affects the rest of the 95% of Verizon customers. The 5% that are affected by this are those who use the most data of of all customer with 3G unlimited data plan. However if you’re on 4G LTE you’re good, you won’t be affected by this. Don’t you think is not a coincidence that that Verizon added this policy back in February but is putting it in effect near the rumored iPhone 5 release date? Think about it Android+iPhone 4+iPhone 5, which we know it will sell like hot coffee, those three devices with all current and new customers Verizon will get from the iPhone 5 could easily congest Verizon’s network and turn it like AT&T.